Exclusivity and handling prowess are guaranteed when purchasing an Alpina B7. Powered by a revised version of the S63 4.4-liter bi-turbo V8, 600hp and 590 lb-ft are sent to all four wheels via an 8-speed automatic gearbox with revised shift tuning. 0-60mph takes just 3.6 seconds with a top speed of 205mph achievable. An Interior Design package adds wood grab handles and trim, a wooden steering wheel, and a faux suede headliner. Available safety features include infrared night vision camera with pedestrian detection and autonomous emergency braking. When BMW M just isn’t exclusive enough, there’s Alpina. But when you want a BMW M car that doesn’t exist yet, what you actually want is the 205 mph Alpina B7. Sure there’s the V12 M760Li xDrive from BMW, but this does with 4 fewer cylinders while still achieving identical outputs. 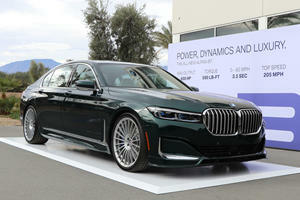 Based upon the regular 7 Series before Alpina fiddle with it, it uses the BMW 7 Series’ carbon core chassis technology to make it 200 pounds lighter than the previous generation Alpina B7 and more than 200 pounds lighter than the M760. But it also has all-wheel drive. Aside from a couple of unique touches – an Alpina badge on the steering wheel, Alpina plaque on the center console, Alpina stitching on the steering wheel, and Alpina graphics on the instrument cluster, the rest of the interior is pure cream of the crop 7 Series. 20-way power adjustable seats feature heating, ventilation, and massage function and Nappa leather upholstery. The steering wheel is heated, as are the rear seats. 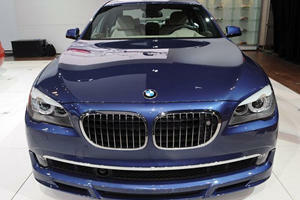 The infotainment system is BMW’s latest 10.2-inch iDrive system with gesture control and a 200 gigabyte hard drive. 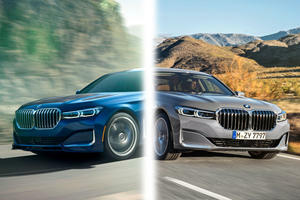 Space is incredibly commodious – the B7 featuring a wheelbase as long as the previous 7 Series’ long wheelbase model – with front and rear occupants able to stretch out comfortably – even with the standard panoramic moonroof. 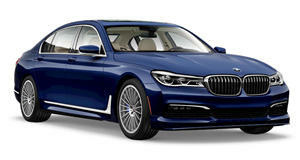 Like the 7 Series, the Alpina B7 has an available 18 cubic feet of cargo volume. It may feature all-wheel drive to put its power down, but Alpina have reconfigured the xDrive system for a higher rearward bias. But they’ve also lowered the Alpina-programmed adaptive air suspension and reworked the all-wheel steering to be more aggressive. The standard 7 Series may have lost its driver-focus of late, but the B7 shows that with some mild tweaking, there’s still plenty athleticism lurking beneath the exterior. Despite the long wheelbase, the rear-wheel steering makes the B7 incredibly nimble through corners – feeling as lithe as a 5 Series despite the extra length. The B7 benefits from the grip of all-wheel drive, but when provoked, oversteer is readily available and the balance feels that of a rear-drive car. But when this much speed is available, you best have the stopping power to match – and the B7’s massive stoppers do an exceptional job without fading under duress. Though the M760Li makes use of a bi-turbo V12, the Alpina B7 makes use of a reworked version of BMW M’s own S63 V8 under the hood – the same engine found in the new M5. Two turbos are housed in the V of the 4.4-liter behemoth, generating M760-matching outputs of 600 horsepower and 590 lb-ft of torque. The standard 8-speed ZF automatic gearbox remains – though revisions improve shift times. 0-60mph is claimed conservatively by Alpina at 3.6 seconds – but may well be quicker, as they’d originally estimated top speed at 193mph, when it now reaches 205. The B7 comes with a fair bit of kit straight out of the box, including four zone climate control and a 600-watt Harman Kardon sound system, wireless phone charging, and the BMW smart key. A range of packages add extra amenities like rear massaging and ventilation, and power reclining rear sets. The Driver Assistance Plus and Plus II packages cater to safety, equipping forward collision mitigation, surround view camera, blind spot monitors, and lane departure warning. An infrared night vision camera is also available as a standalone option. BMW can be rightly slated for losing its edge. Thank the car gods that Alpina hasn’t similarly lost its way! The Alpina B7 is the M7 many have lusted after, with the performance and handling ability to blow the Mercedes-AMG S63 into the weeds.